Nutra-Nuggets Puppy Formula is specifically designed to meet the special nutritional needs of growing puppies as well as those of pregnant or nursing adult dogs. Enhanced with DHA for optimal brain and vision development, our puppy formula also includes an ideal balance of omega-3 and omega-6 fatty acids and chelated minerals for proper condition of the skin and coat, proper development of the immune system and overall good health. Chicken meal, ground maize, chicken fat, brewers dried rice, egg derivatives, dried plain beet pulp, linseed, chicken digest, fish meal, salmon oil. 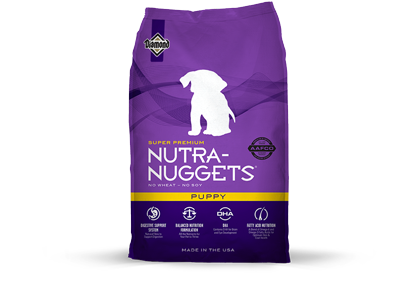 Nutra-Nuggets Puppy Formula is formulated to meet the nutritional levels established by the AAFCO Dog Food Nutrient Profiles for All Life Stages.